Where Did The XD Line Come From? In a word, Croatia. 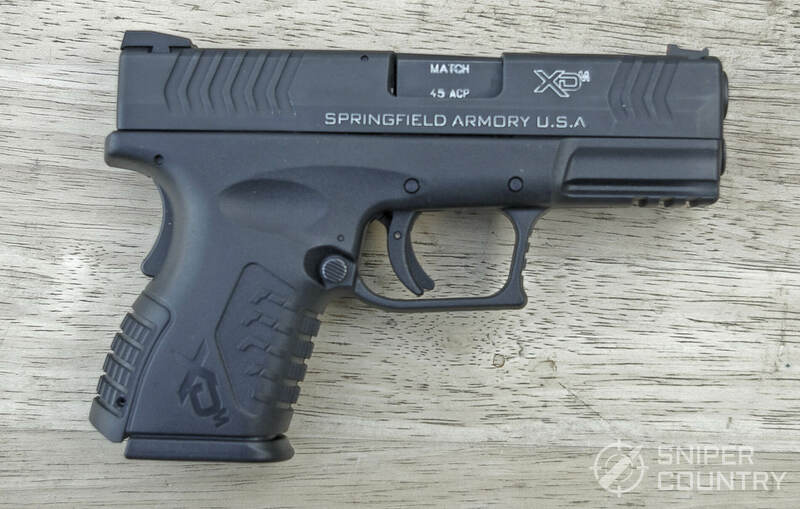 The gun we know as the Springfield Armory (from now on SA) XD pistol started out life as the HS-2000. This was a pistol made by the H.S. Produkt company in the city of Karlovac, Croatia in 1999 which in turn was based on the HS95 (Hrvatski Samokres or Croatian Pistol) that was introduced in 1995. The HS2000 was adopted by the Croatian military and law enforcement agencies – it is still used by those bodies today. It was brought to the U.S., and distributed by HS America as the HS2000 in 9mm. (for you geography and history buffs, Croatia gained its independence from Yugoslavia in 1991. It is situated on the Adriatic Sea). Model Contour frame…the familiar 1911 grip angle is still there, but certain areas of the frame have been contoured and relieved, most notably the upper grip area and backstrap to allow access to controls without breaking your grip. Mold-Tru© backstraps…included with the gun are three backstrap inserts. Small (marked with a “I”), medium (II) and large (III) interchangeable backstraps are in the box. They let you fit the grip more closely to your hand. They slip in at the bottom of the grip and are held in place by a roll pin. Maximum-Reach Magazine Release…the frame has been relieved around the mag release to allow easier access to it. 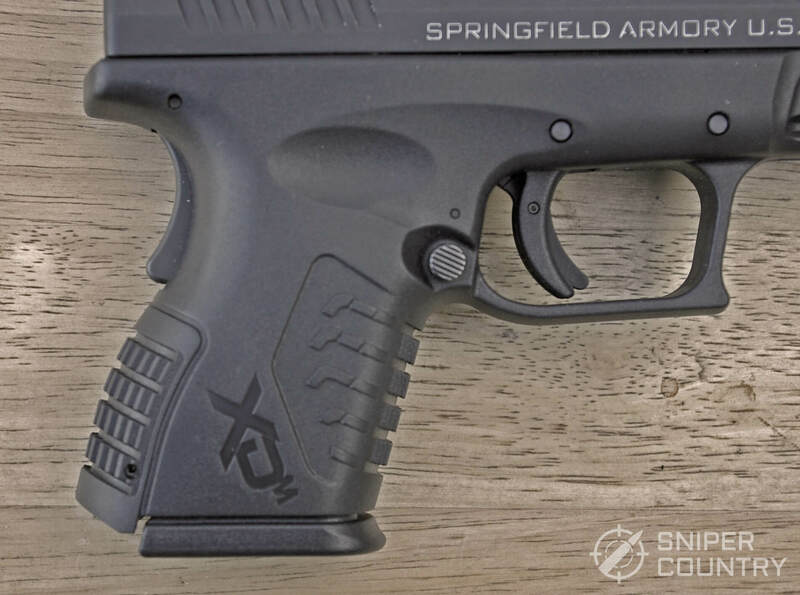 Megacapacity Magazine…my .45 XDM comes with a flush-fit 9-rounder and an extended 13-rounder. If you are shooting the 9mm, you get one 13- and one 19-round magazine; the .40 S&W comes with 11- and 16-round magazines. Mega-Lock texture…very knobby and aggressive, with different patterns in different areas to solidify your grip. It works, at least for me. Multiadjust Rail System…multi-position Picatinny rail. 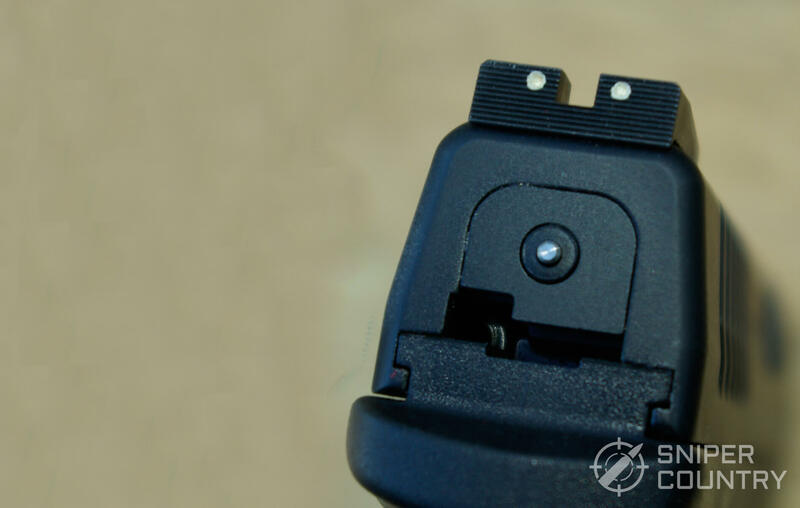 Minimal-Reset Trigger…the trigger resets very close to the rear of the frame. It is shorter than a lot of similar guns’ resets and allows fast follow-up shots. Melonite Finish…tough, long-lasting finish. It was incorporated in 2006 and is essentially the same finish as Glock’s Tennifer finish, according to industry experts. Both are very impervious to rust and usage wear and tear. 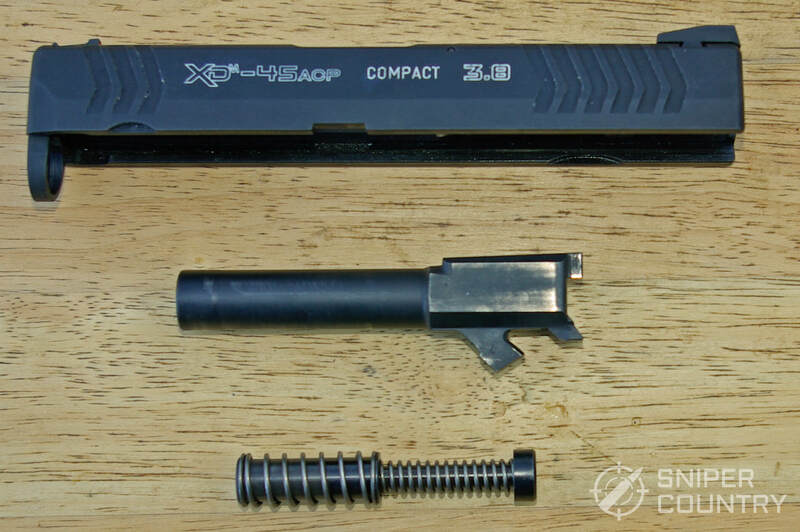 Minimal Error Disassembly…drop the mag, make sure the chamber is empty and lock the slide back. Flip the takedown lever up, release the slide and off it comes. No trigger pull needed. Grip Safety…Love it or hate it, it’s there. When not depressed, the gun won’t fire nor can you retract the slide. With my hand size and grip, it’s a non-issue. Striker Status Indicator…a small, white-colored “pin” (for lack of a better word) protrudes from the back of the slide when the striker is cocked. You can feel it by running a finger over the slide’s rear plate and tell if the gun is cocked, even in the dark. 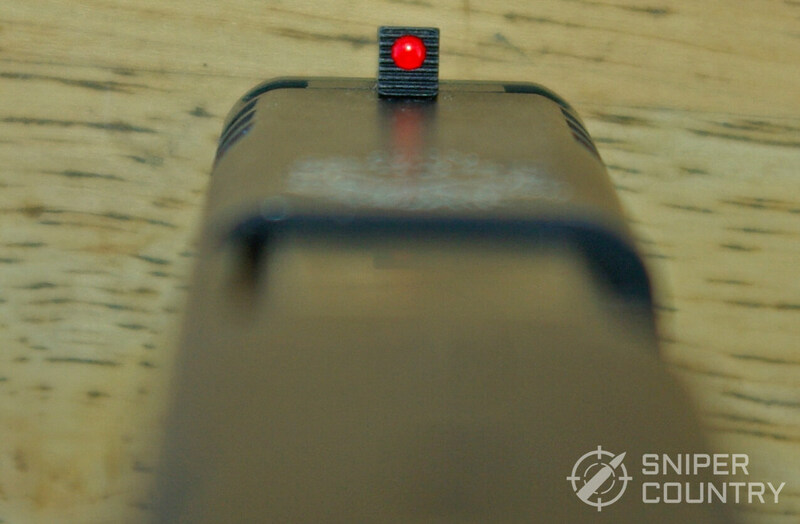 Loaded Chamber Indicator…a bar located at the rear of the ejection port is levered up when a round is in the chamber, allowing you look at it or run a finger over it to check if the chamber’s loaded (even in the dark,as above). I have only put a little over 200 rounds through my gun so far but it’s important to note that I have used the striker status indicator and the loaded chamber indicator several times to ascertain the readiness of the gun to fire. And, I checked it by feel, in daylight. To me, these two features are very useful. Ultra Safety Assurance Trigger Safety…a fancy way of saying the trigger has a blade installed in its face that won’t let the gun fire unless the trigger is pulled, a form of drop safety. This feature is found on many striker-fired guns today. (The third integral safety is the striker block safety that will only allow the striker forward with a trigger pull). 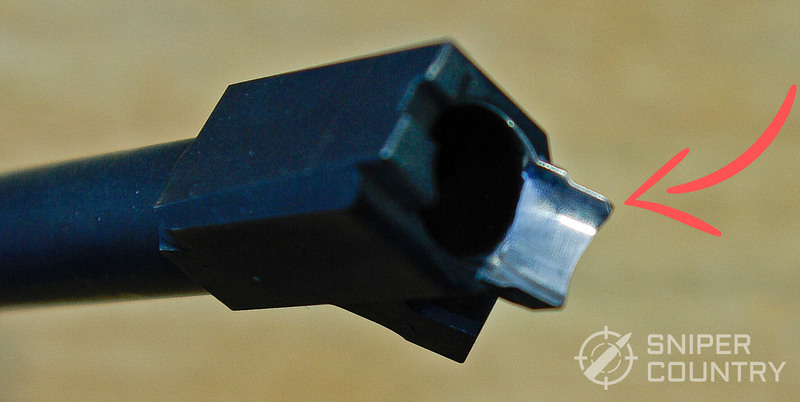 Fiber Optic Front Sight…the front sight uses a fiber optic rod to gather light. Included with the gun are red (installed), orange and green (included) rods that you can swap out for the one installed. My aging eyes appreciate this brighter sight. Night sights are available. 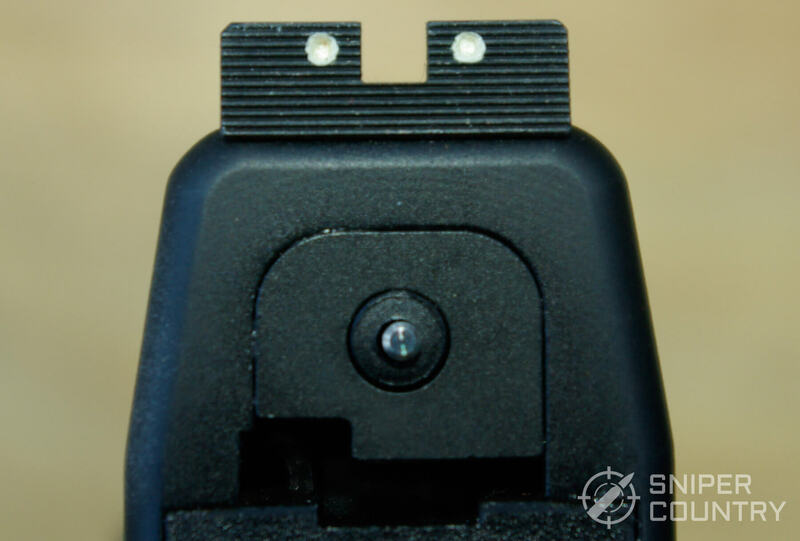 The rear sight is a two-dot, drift-adjustable steel sight with a machined face so that glare is broken up. Ambidextrous Magazine Release…my left-handedness really appreciates this feature. No need to move the release to the right side-it’s already there. Frame Sculpting and Replaceable Backstraps…the XDM frame, sculpted as mentioned above, fits my hand perfectly. This is due to the carving away of parts of the frame that would’ve caused my medium-size hands problems reaching around the grip, problems like I had when I owned a Model 30 Glock. 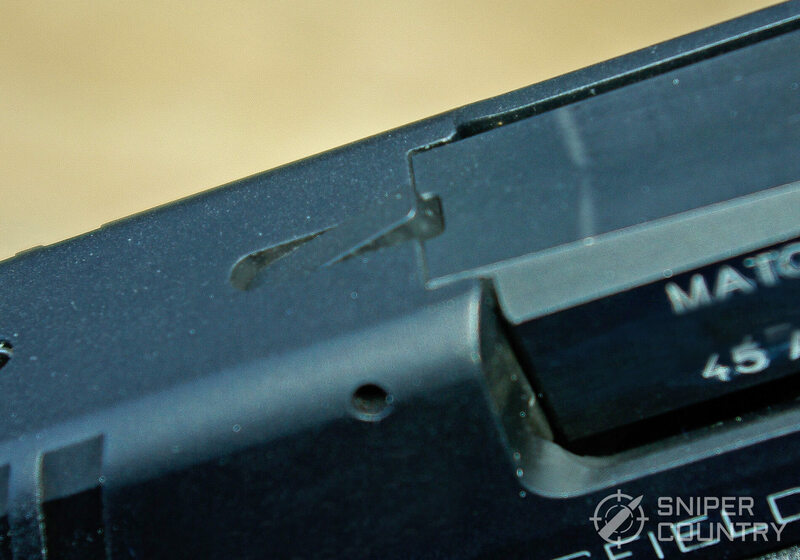 The S/M/L backstraps let you further fine-tune the fit of the gun to your hand. They even include two extra extended magazine grip extensions for any full-size mags you may buy. 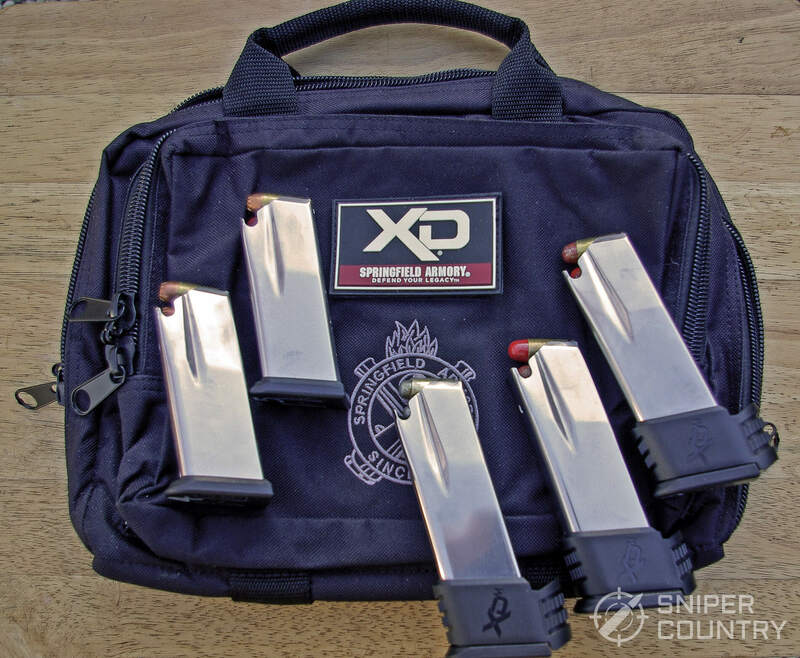 Magazine Capacity Variety…included with my .45 XDM were flush-fit 9-round and extended 13-round magazines, with two extra “sleeves” for any extra 13-rounders out there that are available for purchase. I don’t have to buy extra magazines, because I got in on one of SA’s famous give-aways. This “Gear Up” promo gives you a free range bag and 3 more magazines if you buy before 12/31/18. This is only one of several similar promos that SA has offered over the years. When you figure a .45-caliber magazine is priced around $30 each and add in the bag’s cost, you’re looking at over $100 worth of goodies sent to you gratis. Do other companies offer promos or rebates? Sure. This one was just a really good deal. Semi-Wadcutter / Lead Bullet Compatibility…The Springfield XD pistol series’ barrels do not use polygonal rifling, so lead bullets are OK to shoot. (If there is an XD variation out there that does use that type of rifling, I don’t know about it). About 90% of my shooting consists of putting bullets I cast myself downrange…it makes shooting more affordable for me. As I type this, I have powder-coated bullets that I made yesterday sitting on my bench waiting to be tested in my XDM. They are the Lee 200-grain tumble-lube SWC bullet. 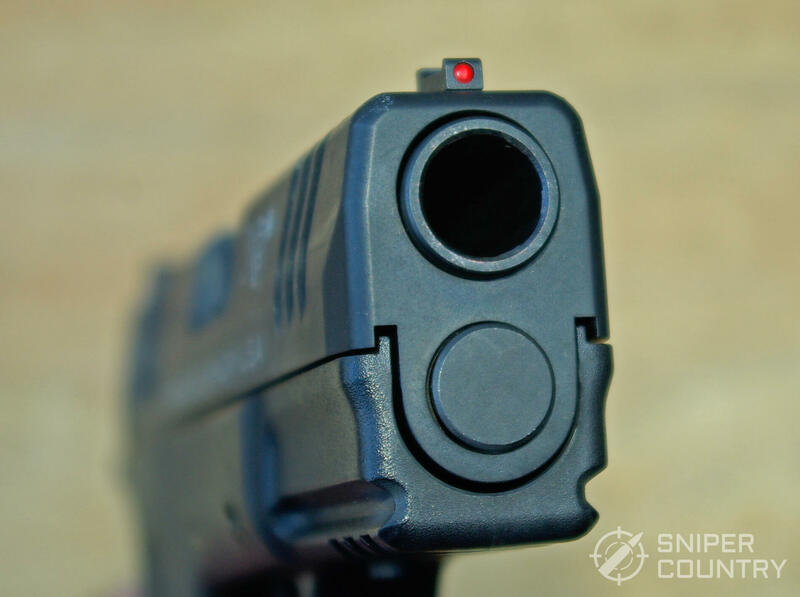 After extensive research, I found that the XDM would feed these bullets where other guns failed (Glock 30, I’m talking to you!). This even includes the original XD pistol. I prefer to shoot SWC bullets, as they cut a nice hole in the target. The SWC compatibility is huge for me. Why do I mention this? I can’t be the only .45 ACP reloader out there who is looking for a gun that’s SWC-reload-friendly. I have shot both that tumble-lube SWC and Lee’s version of Jeff Cooper’s favorite cast .45 bullet, the old Hensley & Gibbs 68 (longer nose, one deep grease groove and a sharper shoulder) through my XDM with zero problems. It doesn’t matter which bullet I load…as long as they are seated with the shoulder flush with the case mouth, they feed reliably. 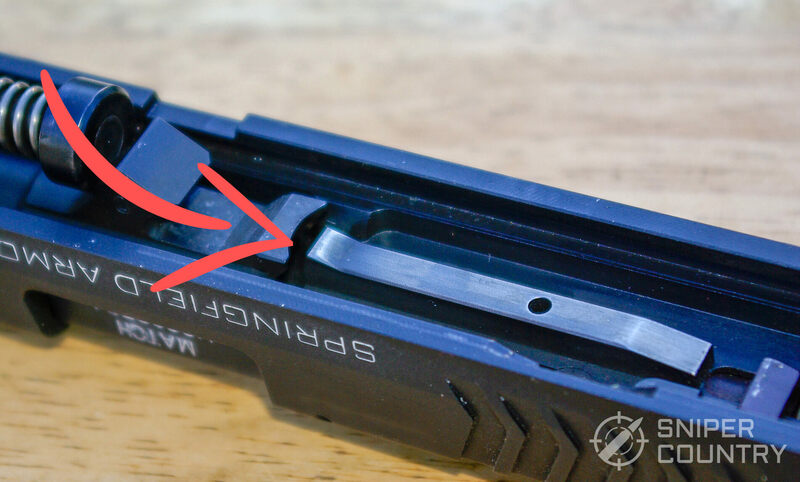 I understand that this is due to a small “hump” built into the central feed rail on the slide bottom that depresses the top round in the magazine as the slide reciprocates, so the extracted case rim clears the on-deck bullet in the magazine. The older XD didn’t have this hump and the extracted case would catch on the shoulder of the SWC and jam. How to tell? Pull the slide and look at that rail – if it’s flat all along its length, then SWC bullets are a no-go. The little hump, right at the breech face end of the rail is what you’re looking for in order to use SWCs. So, I’m a happy reloader and grateful that SA addressed this issue. A Kinder, Gentler Gun…To paraphrase Pres. Bush, the XDM seems to be just about the softest-shooting .45 auto I’ve ever shot. I’m not quite sure where that comes from, other than the obvious reasons such as: the gun fitting my hand very well; the relatively high grasp I get on the frame which helps mitigate recoil and the recoil spring’s weight and configuration. I know it’s not magic – it’s just a softer-shooting gun, at least for me. So, we have long lists of M-factors and features. What do they mean when the gun is in my hand and I’m sending rounds downrange? It’s pretty simple, actually…the gun is a shooter, it’s accurate and reliable. It’s not met a handload of mine yet that it doesn’t like – all of my loads are at least on the paper, which is more than I could say with some other guns (same loads, different guns). Most of them are to point of aim, with a center hold. We’ll look at more on this when we discuss shooting the gun. 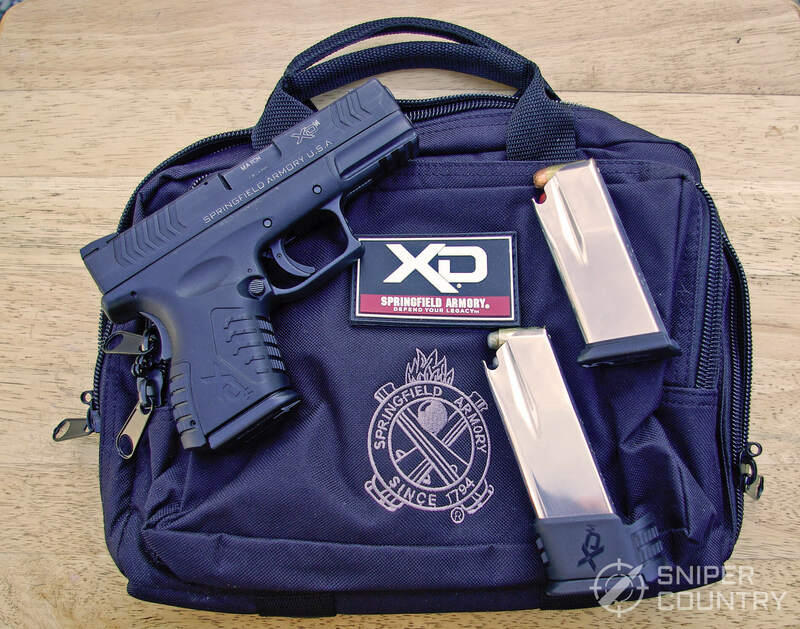 So…now that we have this XDM, how are we going to use it? What need is it good at meeting? Obviously, it is a very effective carry gun, target pistol, range gun, competition gun…wait a minute…how can one gun be all those things? In a word, magazines. You get a flush-fit 9-rounder for concealed carry. That allows the gun to hide well inside the waistband or in a belt holster with cover garment. The other uses are possible due to the fact that you also get an extended 13-rounder with the gun. Couple that with the Gear Up promotion I participated in and I have three 13-round and two 9-round magazines, not to mention the cool range bag. So, if I were the competing type, I should be pretty much good to go in terms of ammo with 58 rounds in or near the gun and at the ready. Really, there are plenty of ways to use a gun like this…I stroll through the woods on occasion and this gun with a long magazine will go with me the next time I venture forth. I also test handloads until I find one that is a keeper…I can see loading five different loads in five different magazines to try. That should save some time. 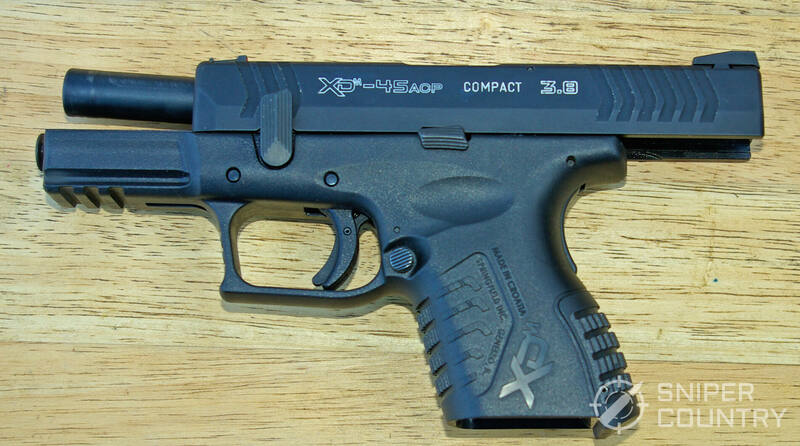 Whatever your plan or purpose where a .45-caliber pistol is concerned, I believe the XDM should fit right in. I now have a batch of shiny red powder-coated tumble-lube Lee SWC bullets ready to load. My load of choice is 5.3 grains of 231/HP 38 with that 200 grain bullet. It’s on the lower-pressure side of the handloading manual, but it makes a great practice round and doesn’t bend anything. With the XDM’s ability to shoot semi-wadcutter bullets, it’s like when Dorothy lands in Oz and opens the door…simply amazing! I have had too many picky .45s that wouldn’t feed them – the Glock 30 is just the latest – so I am very pleased to be back in my semi-wadcutter world of reloading. They just cut cleaner holes than the round-nose bullets. 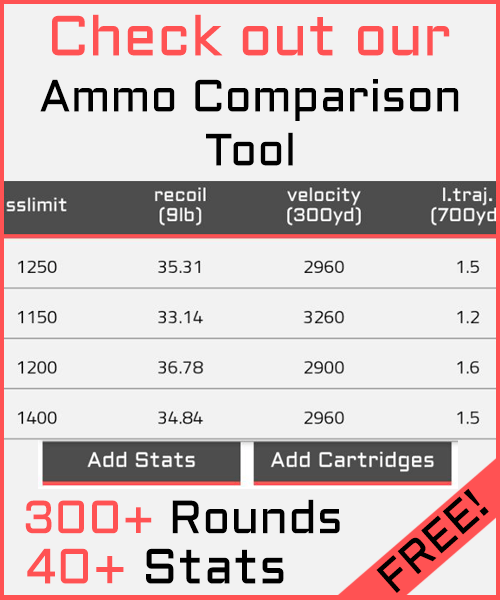 Plus, you get five more per pound of lead over the 230s, for those of you who keep track of such things (30 230-grain vs. 35 200-grain…I figured it out. I’m not sure what that says about me…). 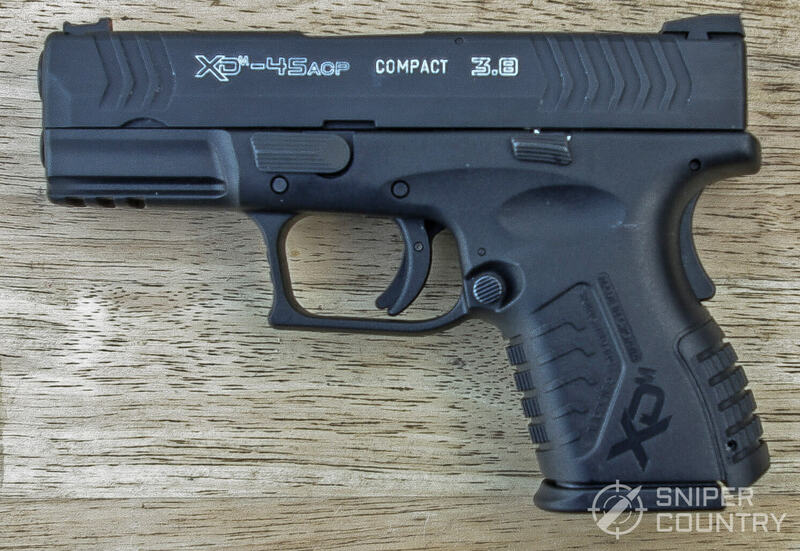 At any rate, the XDM is the most reliable, accurate and soft-shooting .45 I’ve handled in a long time. The grip ergonomics, recoil spring configuration and high hand-hold on the frame all have something to do with the soft-shooting part. Plus, the internal design changes help immensely when I shoot my handloads. It all comes together and works well for me. I will attempt to track the number of shots roughly to inform you how the gun does as time goes on. I will only count for a couple of weeks, but it should give me some idea of any reliability or other issues that I might encounter. So far, I’ve put about 220 rounds through it. That’s isn’t many, for sure, but it’s a start. At least there was no “break-in period” like other guns require. I remember that the Kahrs I’ve owned really didn’t work like they were supposed to until you’d put at least 200 rounds downrange, and I recall a couple of others that needed a break-in period as well. The XDM didn’t need that. I took it out of its (very nice, hard-case) box, cleaned it a bit and lubed the slide rails then I went out and shot it. It worked fine. The only malfunction of any kind was due to my ammo, not the gun’s fault. It doesn’t like light target ammo (a really light charge of Tite Group)… it had a little trouble ejecting the empty case. There was not enough “oomph” to function the slide completely. Once I figured out a reasonable load, it ran very well with not one stoppage. With reliable reloads or factory ammo, you’d better bring your lunch because you’re going to be there all day shooting. It’s that much fun to shoot. 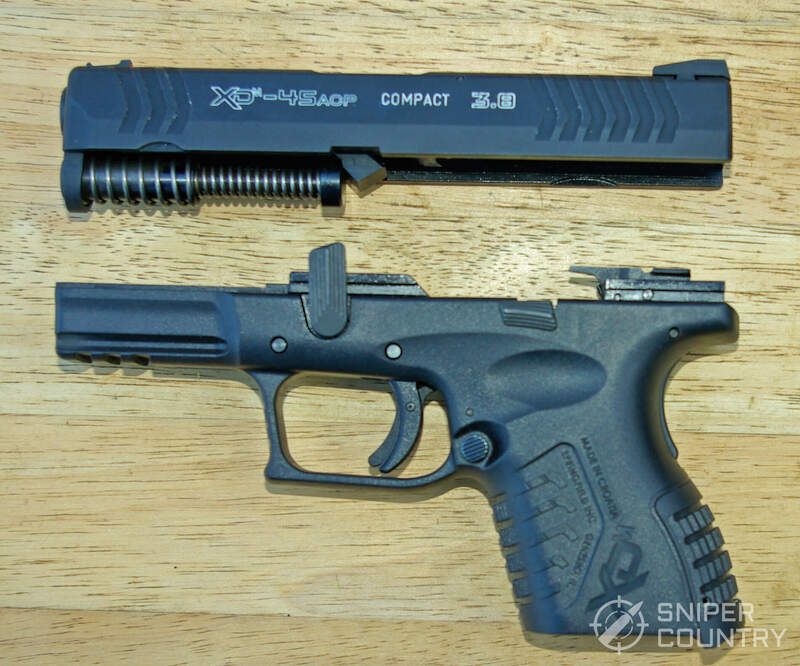 And, for you 1911 guys and gals, the grip angle of the XDM is very close to that of Ol’ Slabsides. 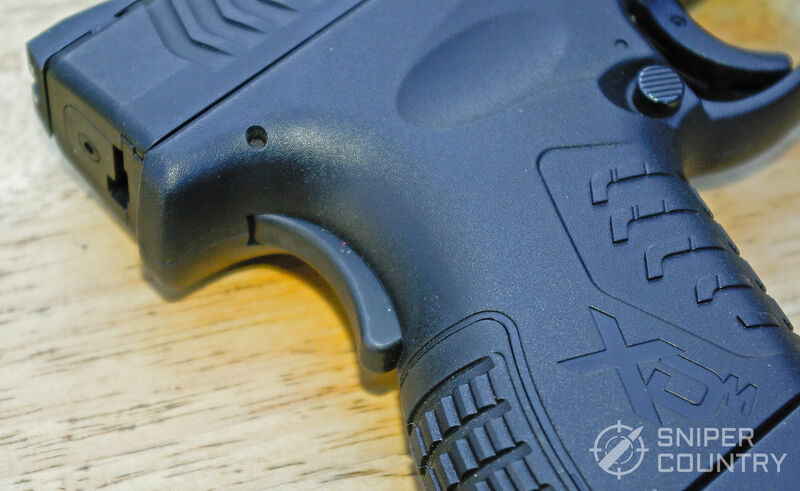 You most likely wouldn’t need to adapt your grip too much to feel at home with the XDM. 1. Make sure the chamber is empty and the magazine removed. (PLEASE double-check that…I once put a hole in my cleaning bench with a round fired from a gun that was “empty”. It required a trigger pull to release the slide, so I did that. Did you know that some semiautos will fire even if they’re not 100% in battery? No harm was done except to my pride (and a .45-caliber hole in the wood), but it could’ve been dicey. ALWAYS double-check your chamber!). 2. Once truly cleared, pull the slide back and lock it with the slide stop. 3. Turn the take-down lever up from its 9:00 to a 12:00 position. 4. Release the slide and remove it from the frame, sliding it off the rails. 5. 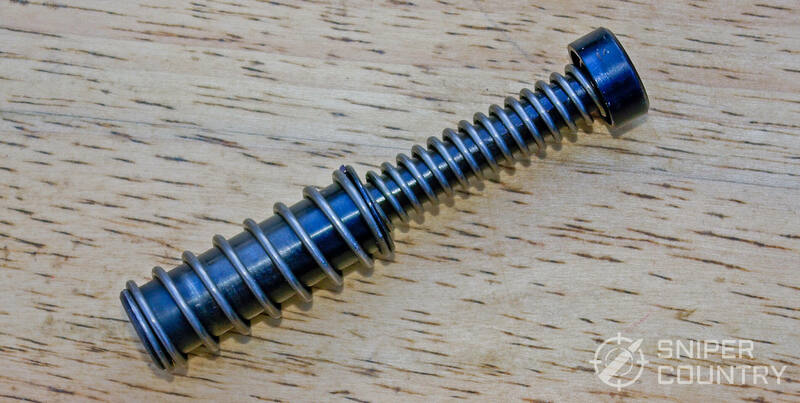 Remove the recoil spring (captured, so you don’t have to go on a “find-the-spring” safari). After cleaning all the fouling off (see below), check your reflection in the polished feed ramp. OK, that’s a joke but is based in fact. SA puts a mirror-like polish on their feed ramps. 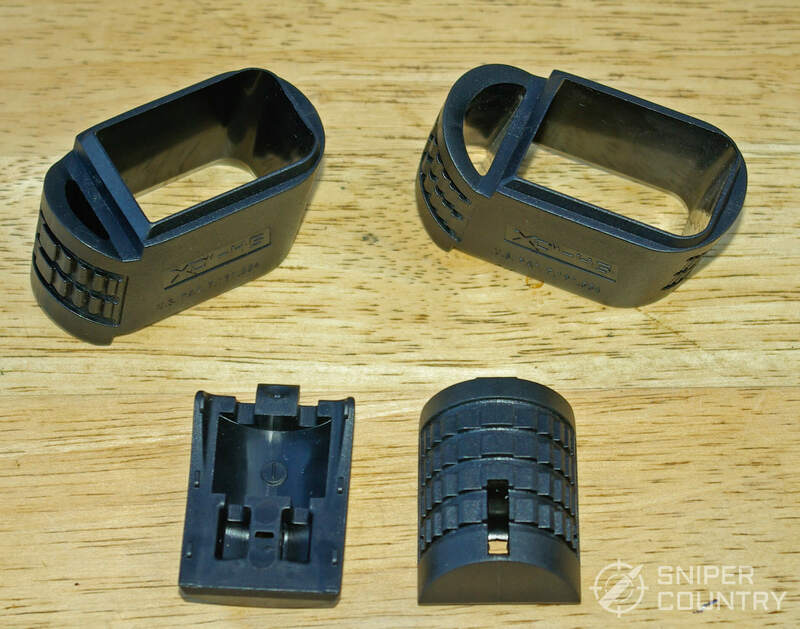 I have always admired that feature, as it helps feed whatever type of ammo you put in the magazine and it saves me from having to polish it myself. The XD pistols (and most other SA products) have the most highly-polished feed ramps I’ve ever seen on production guns. 7. Notice what step you did not see? The pull-the-trigger-to-release-the-slide step. 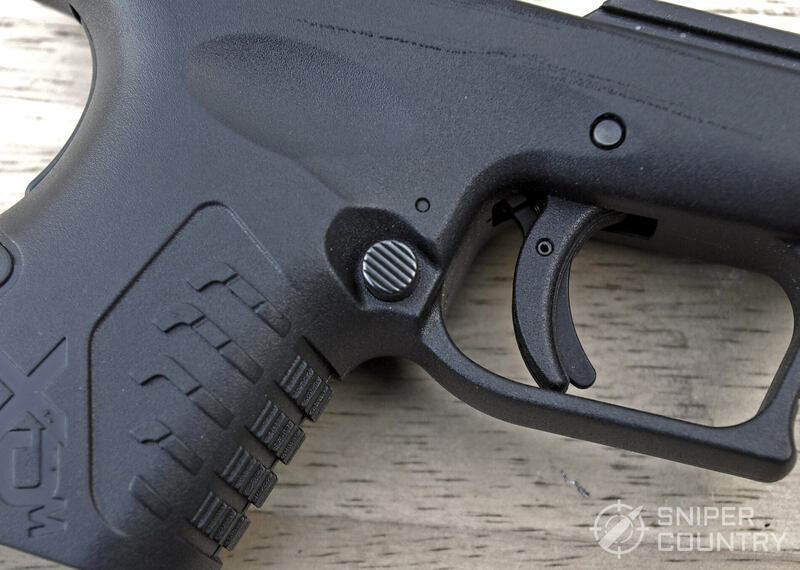 The XDM does not require a trigger pull, but the Mod. 2 guns do. (Hence, no chance of another hole in my bench. I learned a lesson that you should take to heart. “Empty” means EMPTY). That’s it. Go no further unless you’re a gunsmith or you work for SA. There’s no need for further exploration. I certainly don’t take mine apart any further than that…I don’t want to have a part or two left over when I’m done “gunsmithing.” Leave it alone. 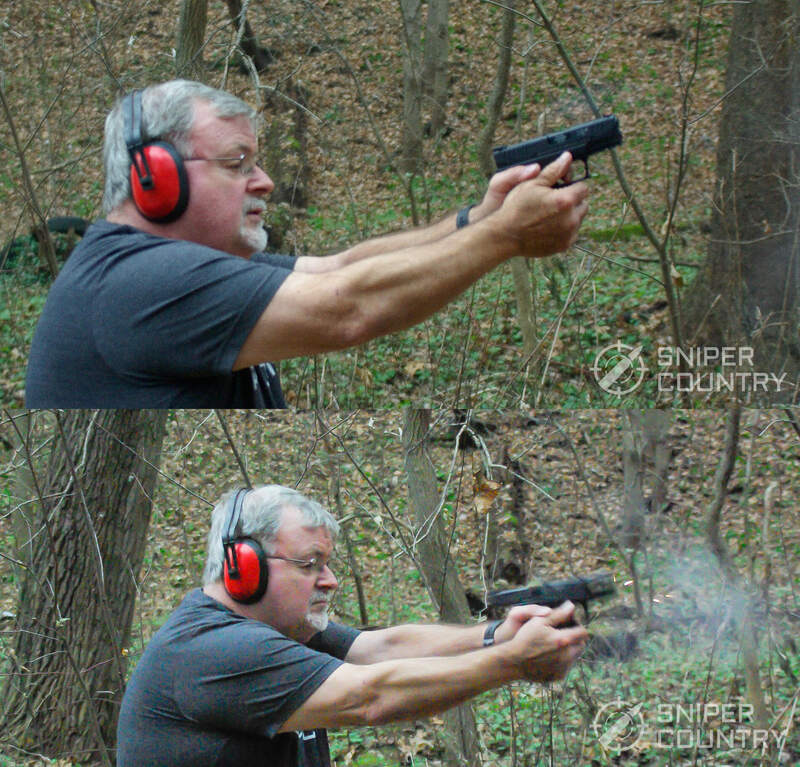 OK…after you shoot your XDM, you clean it, right? Yessir. Even if I shoot five rounds over a chronograph, I’ll at least wipe it off and run a quick patch down the barrel. I occasionally read in the gun forums or see on YouTube videos guys who say they’ve never cleaned their gun since they bought it and it’s had five gazillion rounds through it. Guns are meant to be cleaned after shooting, or else owner’s manuals wouldn’t spend time, ink and paper telling us how to do that. Sometimes I wonder if the folks who are the non-cleaners ever change the oil in their cars…it’s still showing up on the dipstick, right? There is one exception to the clean-it-or-else camp – the “torture test.” This is where a brave soul with more money than I have will purposely try to destroy his/her firearm by not cleaning it ever, dunking it mud, freezing it, etc… They then will fire it (or attempt to) and prove their point that their “Brand X pistol” is THE toughest, most reliable gun that ever came through a gun manufacturer’s front gate. If you work for a gun manufacturer, fine – go ahead and test your product. If you don’t…don’t. There are too many variables involved that could go south on you in an instant when you shoot a gun that, say, had been dunked in a bucket of mud. All it takes is one tiny bit of grit in the bore to make you wish you really hadn’t done that. I’m not even considering what happens to the ammo in the magazine during these “tests”. So, clean your XDM at least once in a while. Take the gun apart as described above. Run a .45-caliber brass bristle brush (Best Gun Cleaning Kits) soaked in Hoppe’s or your favorite solvent through the barrel from the breech end, making sure to pay special attention to the chamber and barrel grooves. Do this several times. Some folks won’t pull the brush back through the barrel – they’ll unscrew it and just push it one way. Whether or not to do this is up to you…I’ve not had any adverse effects by not unscrewing the brush. Examine the bore, as much as you can as it will be very wet & dirty. Run as many clean patches through the bore until the last one comes out clean. There are different ways to do this…I discovered that, by using another brass bristle brush with the patch draped over it, that it will push against the grooves by spring action of the bristles and it really gets the barrel clean. There are a ton of tools and methods you can use to clean your barrel (we won’t go into barrel leading here-that’s another article). Whatever method you use, you should be able to hold the muzzle end of the barrel up to a light and look into the feed ramp end and see a clean, shiny barrel after a few wet-then-dry patches have been run through it. Take a clean rag and dampen it with a bit of your solvent-of-choice. Wipe around the firing pin hole in the breech face and anywhere else you see black fouling. The trick is to get all the grunge out or off the surfaces. An old toothbrush (or a similar brass brush) is good at getting under the extractor and into nooks & crannies where a rag can’t go. Wipe off the barrel exterior and feed ramp. Usually, the recoil spring doesn’t need much attention but you can wipe it off with solvent if you like. Check the underside of the slide. The central rail, striker disconnect button and the inside-top of the slide where the barrel rides should be wiped off. It is important that the central (feed) rail is very clean and has no machine marks, burrs, etc. on it. A “slick” rail can be very beneficial. Once the slide, barrel and spring are clean, look at the frame. Wipe off any obvious fouling around the ejector and the inside-rear part of the frame. Being clean is good here, for sure. The frame rails need special attention, both on the frame and the slide. I’ve saved this last slide operation so I could discuss it along with its frame counterpart. The rails need to be clean. Take a toothbrush or Q-tip and clean the slide rail grooves until the cleaner comes out clean. Do the same to the frame rails, but use a fresh Q-tip. Again, clean is very important when you’re talking slide rails. Dirty, fouled rails can contribute to sluggish slide action, which might in turn cause malfunctions so keep ‘em clean. Put a drop (one) of good gun oil in each of the four frame rail slots and wipe off the excess. Some owner’s manuals will have you put a drop of oil at the rear of the frame where the springs are…the jury’s out on this as far as I’m concerned. Look in your owner’s manual for specific cleaning instructions here. Remember, a drop is a drop, not a glug. The same applies to the striker spring in the slide…you’re better off not coating that in oil. Whatever you do, don’t drown the firing pin channel in oil…it will get progressively more sluggish and then most likely will start causing misfires, especially if you live in a dusty environment. Leave it alone. Wipe all internal parts off to remove excess oil and solvent. (For a good guide to gun oils and lubes, check this article out). 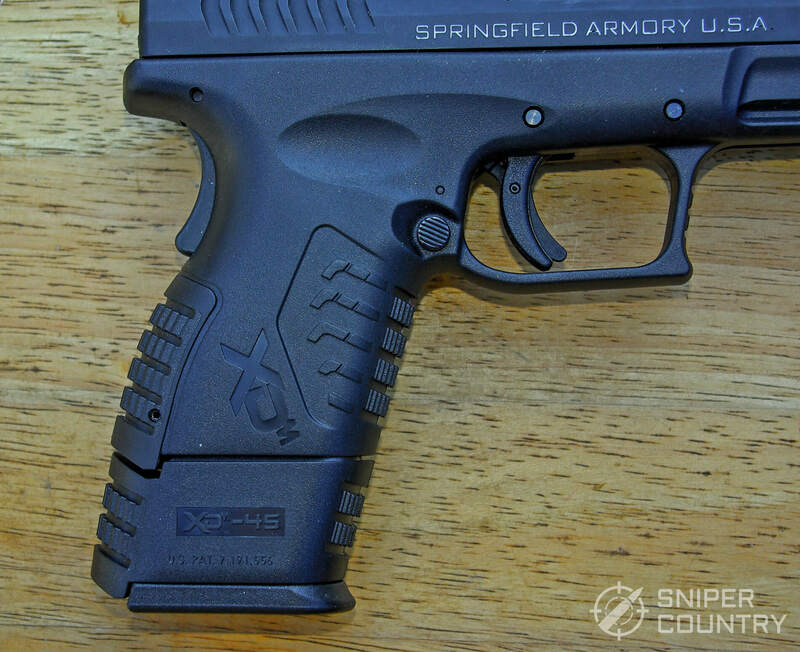 Reassemble the XDM and wipe off any extra oil. That’s it! 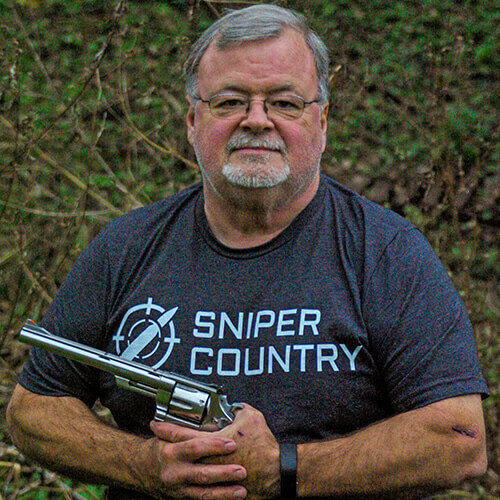 The finish is really tough and impervious to rust but I still like to use one of those great rags that Ruger sends out with their guns to wipe the pistol with, mostly out of habit. It can’t hurt anything. Secure the gun safely – lock it away unless you have a reason not to. Gun security, like removing barrel leading, is a whole different article…just keep it safely stored. SA, in their printed material that came with the gun, said they would warrant the gun to the original owner as long as that owner owns that gun. Read about it here. That’s a win/not-so-sure-I-win proposition. If you’re the original buyer and you keep the gun, you’re good to go. If, on the other hand, you buy it used then SA can legally refuse to service the gun as a warranty claim. This is the only part of the SA experience that I don’t really like. Most of the other major manufacturers will fix their guns for free (within limits) no matter if you’re the first or thirty-second owner. That is how gun makers win friends. I doubt if the warranty is a deal-killer but I wish SA would re-think their strategy. 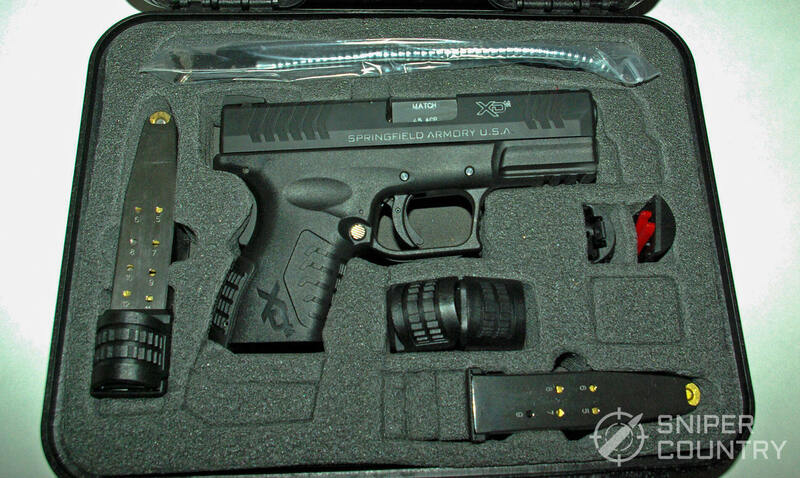 In the end, what you have with an XDM is a heck of a gun with a lot of features for the money. Without rehashing all the pluses, let’s just say that I looked at several different guns before buying and settled on this one. As I said earlier, I’m no expert but I do enough research and have had 40-plus years of experience where handguns are concerned and I think I know a good thing when I see it. When you factor in the free-range bag-three-free magazines promotion until the end of 2018, it’s a double-win situation. As I stated above, this is the most accurate, softest-shooting .45 I’ve ever owned and I recommend it…you could sure do worse!